Professor M. Cherif Bassiouni passed away on 25 September 2017 in Chicago, at the age of 79, surrounded by his loving family. The Siracusa International Institute mourns the disappearance of its father, a renowned jurist driven by an inexhaustible passion for upholding the rule of law and protecting human rights. M. Cherif Bassiouni was Emeritus Professor of Law at DePaul University where he taught from 1964-2009. He was a founding member of the International Human Rights Law Institute at DePaul University which was established in 1990. He served as President from 1990-2008 and then President Emeritus. In 1972, he was one of the founders of the International Institute of Higher Studies in Criminal Sciences (ISISC) located in Siracusa, Italy, where he served as General-Secretary from 1972-74, Dean from 1974-1988 and then as President to date. He also served as the Secretary General of the International Association of Penal Law from 1974-1989 and as President for three five-year terms from 1989-2004. He was currently Honorary President of the Siracusa International Institute from 2015-September 2017. 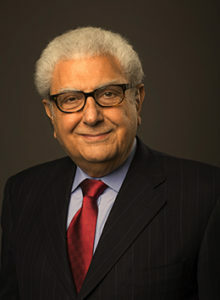 Professor Bassiouni was a Guest Scholar at the Woodrow Wilson International Center for Scholars in Washington, D.C. in 1972; Visiting Professor of Law, New York University Law School in 1971; Fulbright-Hays Professor of International Criminal Law, University of Freiburg, Germany in 1970; non-resident Professor of Criminal Law at University of Cairo from 1997-2007. He also lectured at various universities in the United States and abroad. Since 1975, Professor Bassiouni has been appointed to 22 United Nations positions, including the following: Chair and then member of the Commission of Inquiry for Libya (2011-12); Independent Expert on Human Rights for Afghanistan (2004-06); Independent Expert on the Rights to Restitution, Compensation, and Rehabilitation for Victims of Grave Violations of Human Rights and Fundamental Freedoms (1998-2000); Chair, Drafting Committee of the Diplomatic Conference on the Establishment of an International Criminal Court (1998); Vice-Chair of the General Assembly’s Preparatory Committee on the Establishment of an International Criminal Court (1996-98); Vice-Chair of the General Assembly’s Ad Hoc Committee on the Establishment of an International Criminal Court (1995); Chair of the Commission of Experts Established Pursuant to Security Council 780 to Investigate Violations of International Humanitarian Law in the Former Yugoslavia (1993-94) and the Commission’s Special Rapporteur on Gathering and Analysis of the Facts (1992-93); Consultant to the Sixth and Seventh United Nations Congress on Crime Prevention (1983 and 1985); Consultant to the Committee on Southern African of the Commission on Human Rights (1980-81); Co-chair of the Independent Committee of Experts Drafting the Convention on the Prevention and Suppression of Torture (1978); and Honorary Vice-President at the Fifth United Nations Congress on Crime Prevention (1975). He also served as Chair of the Bahrain Independent Commission of Inquiry which was established in 2011. Between 1973-2003, Professor Bassiouni served as a consultant to the U.S. Department of State and Department of Justice on projects relating to international traffic of drugs (1973), international control of terrorism (1975 and 1978-79), the defense of the U.S. hostages in Iran (1979-1980), governance and democracy projects in the Middle East and North Africa (1991-92), and the future of the Iraqi justice system (2002-03). Professor Bassiouni has authored 24 books and co-authored 4 more, edited 46 books, testified before the U.S. Congress 18 times, and authored 258 articles on International Criminal Law, Comparative Criminal Law, Human Rights, and U.S. Criminal Law that have been published in various law journals and books. Additionally, he has written 14 Monographs on such subjects as history, politics, and religion. Some of these publications have been cited by the International Court of Justice (ICJ), International Criminal Tribunal for the Former Yugoslavia (ICTY), International Criminal Tribunal for Rwanda (ICTR), the European Court of Human Rights, and the highest courts of: Australia, Canada, India, Israel, Trinidad and Tobago, South Africa (Supreme Court and Constitutional Court) and United Kingdom (House of Lords, Court of Appeals, High Court and Divisional Court of England & Wales, and Scottish High Court of the Judiciary), and New Zealand. In the United States, the United States Supreme Court, U.S. Circuit and District courts, as well as various State Supreme Courts have repeatedly cited his works. Several of his books and articles have been written in and translated into: Arabic, Chinese, Farsi, French, German, Hungarian, Italian, Portuguese, Russian and Spanish. He received nine honorary degrees from six countries. They are: Doctor of Law Honoris Causa, University of Salzburg (2013); Doctor of Law Honoris Causa, University of Tirana, Albania (2013); Doctor of Law Honoris Causa, University of Ghent, Belgium (2011); Doctor of Law Honoris Causa, Case Western Reserve University, United States (2010); Doctor of Humane Letters Honoris Causa, Catholic Theological Union, United States (2009); Doctor of Law Honoris Causa, National University of Ireland, Galway (2001); Doctor of Law Honoris Causa, Niagara University, United States (1997); Docteur d’Etat en Droit Honoris Causa, University de Pau, France (1986); and Dottore in Giurisprudenza Honoris Causa, Università di Torino, Italy (1981). He has been awarded eleven medals from seven countries. They are: Order of Duke Branimir, Croatia (2013); Order of Merit of the Republic (Cavaliere di Gran Croce), Italy (2006); Ordre des Palmes Académiques (Commander), France (2006); Grand Cross of the Order of Merit, Germany (2003); Legion d’Honneur (Officier), France (2003); Order of Lincoln, Illinois, United States (2001); Grand Cross of the Order of Merit of the Austrian Republic (1990); Order of Scientific Merit (First Class), Egypt (1984); Order of Merit of the Republic (Grand’Ufficiale), Italy (1977); Order of Merit of the Republic (Commendatore), Italy (1976); and Order of Military Valor, Egypt (1956). Among the many distinctions and awards he has received are the Nomination for the Nobel Peace Prize (1999); American Society of International Law Goler T. Butcher Medal (2014); The Stockholm Human Rights Award (2013); Wolfgang Friedmann Memorial Award of Columbia University (2012); Cook County Bar Association Lincoln Award (2012); Dominican University’s Bradford O’Neill Medallion for Social Justice (2011); George Washington University Distinguished Alumni Scholar Award, Washington DC (2010-2011); Washington University School of Law, World Peace Through Law Award (2010); DePaul University Via Sapientiae Award (2009); Hague Prize for International Law (2007); Cesare Beccaria Justice Medal of the International Society for Social Defense (2007); The Medal of the Commission de Derechos Humanos del Estado de Mexico (2006); DePaul University St. Vincent DePaul Society’s Humanitarian Award (2000); International Association of Penal Law- V.V. Pella, Champion of International Criminal Justice Award (1999); John Marshall Law School’s Lifetime Achievement Award (1999); Defender of Democracy Award from Parliamentarians for Global Action (1998); United Nations Association’s Adlai E. Stevenson Award (1993); The Special Award of the Council of Europe (1990); and The Secretary-General of the Council of Europe’s Award (1984). Professor Bassiouni began his education in Egypt where he obtained an LLB from the University of Cairo. He also pursued his legal education in France, Switzerland, and the United States where he earned the following degrees: J.D. Indiana University; LL.M. John Marshall Law School; and S.J.D. George Washington University.